The Irish Design Shop kindly invited me to be featured on their ‘Stories’ where I chat all about my new studio space and the processes involved in creating the Homegrown Collection. Rebecca Killen is an award-winning ceramicist based in picturesque Castlewellan, Co. Down. She specialises in slip casting to create both functional and decorative pieces which draw on a sense of nostalgia. Rebecca's work is available to purchase here. 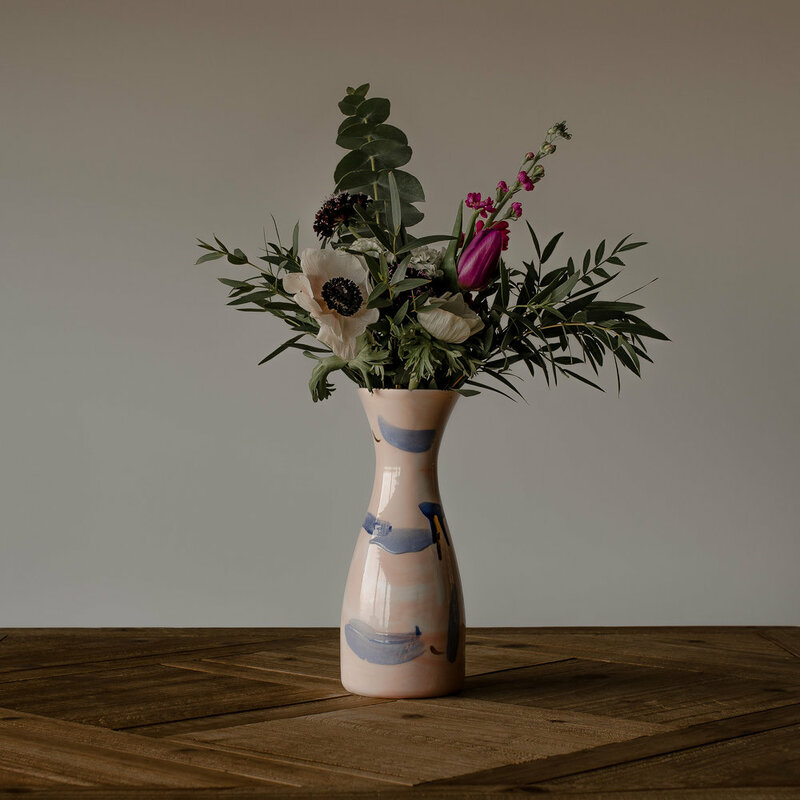 I aim to create ceramic products that can evoke memories, a sense of nostalgia or serve as decorative pieces in the home to be used and treasured for years to come. Our bottles, dishes and vessels are made in small batches using the slip casting technique. This involves pouring liquid bone china into plaster moulds which I have made from found objects and turned forms. -Could you describe your studio to us? What is your favourite thing about the space and how do you get into the mindset of making? I have had a busy and exciting Summer, moving into my very own ceramics studio. The space is located at a horse riding centre beside a forest in Castlewellan, Co. Down. 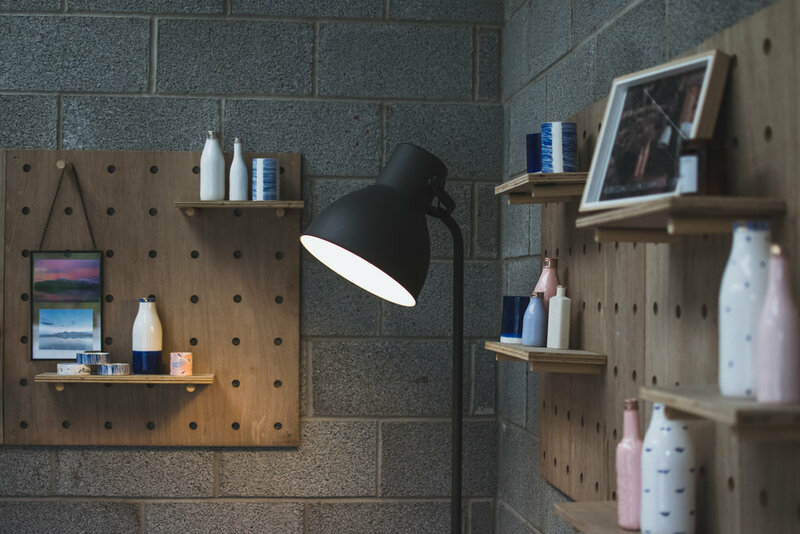 It used to be a tack shop for the centre but when I arrived we had a blank canvas to play with, to make our own and create a multipurpose space where I can work from and display the products. I have tried to create an inviting studio where people can not only view and buy the work but also get an understanding of how the pieces are made. My favourite thing about the space is the tranquillity of the location, it is so peaceful with beautiful views across the County Down countryside yet there is a certain buzz about the place with people coming and going to the trekking centre. To get into the mindset of making I usually listen to podcasts or audiobooks, they really help me to focus on the day’s tasks and when doing some of the more repetitive parts of the making process. Some of the podcasts I listen to are orientated towards pottery and creative businesses where others are purely for escapism. I don’t use anything overly complicated in the studio, but couldn’t create the work I do without a few simple tools; fine paintbrushes, sharp pottery knives and I seem to get quite attached to certain sponges that fit precisely in my hand to smooth along the rims of the bottles. -Can you describe the making process and inspiration behind your Homegrown collection? I love working through all the required processes to make a piece of work, it takes around 2 weeks from start to finish but there is something very relaxing about getting into a rhythm of working whether it be casting a batch of work, sponging away the little impurities in the clay, glazing the pieces or applying the hand painted decoration. The Homegrown collection celebrates places of historic industry throughout Ireland. I have been collecting beautiful antique bottles from old mineral water companies and pharmacies for a few years. The shapes and textural detail on the bottles are really intriguing and aim to connect the viewer to a particular place. All the pieces are created using bone china, in itself a material with traditional associations but I hope to bring a fresh approach to the medium with the Homegrown collection offering bottles in millennial pink, dusky blue and white each finished with stripes of gold along the rim. What led you to choose this craft as a profession? What do you love most about it? I have loved working with clay since studying art at school, my teacher was also a potter and his passion for clay was infectious so he has a lot to answer for. My journey into a career in ceramics has been quite methodical, I specialised in ceramics at the Belfast School of Art and took a year out to study business at a liberal arts college in the States. After graduating, setting up a business combining my passion for ceramics and my new found skills in business felt like a natural progression. In saying this it hasn’t been all plain sailing, I have had so much help over the past few years with business and creative mentors and have completed a business development scheme (Craft NI’s Making It programme) which was massively beneficial in the early growth of my business. I feel so blessed to be able to do what I love every day, it is such a privilege and something I try to not take for granted. I am loving being in my new studio, opening this space has really been a dream come true for me. All my pieces are handmade which means that no two are identical. The distinctive blue and white palette gives them a unique hallmark.